The small market town of Lechlade (or Lechlade-on-Thames) sits on the southern edge of the Cotswolds and is in fact pretty much as far as you can navigate the River Thames. As a result it is something of a magnet for narrow boats and cruisers during the months. Before you arrive in Lechlade you will probably spot the tall spire of the parish church which is visible from miles away. The present day St Lawrence's dates back to 1476, although there has been a church on the site for much longer. Considered one of the finest parish churches in Gloucestershire it is said the churchyard inspired visiting poet Percy Shelley to write "A Summer Evening Churchyard". Whether this is the case or not the path leading through the churchyard is named "Shelley's Walk". The town sits just to the north of the river and there are two bridges. The oldest, St John's, dates back to the 13th century. It is located just to the east of the town where there was once a priory. Halfpenny Bridge lies just to the south of the town centre and was built in 1792. The name refers to the toll that was charged to cross the bridge up until 1839. Whether you arrive here by boat or are just passing through there is always plenty going on. Perhaps the liveliest spot in town is the riverside Trout Inn set on the northern end of St John's Bridge. As well having regular live music this is a proper angler's. The walls adorned with stuffed fish are a nod to the fact the pub has the fishing rights to the well-stocked river here. If fishing isn't your thing then you can try one of Lechlade's five other pubs. For a small country town Lechlade has more than its fair share of events. The summer sees two music festivals; in July there is "Troutfest", a lively mix of bands, beer and cider held at the afore mentioned Trout Inn. Equally lively is Lechlade Music Festival in May offering an eclectic mix of music. If you are looking for daytime activities then head for the river. Thames boat trips and river cruises are available throughout the summer season along with fishing tackle for hire. As well as travelling the Thames by boat you can walk the Thames Path which passes here. Running from the source of the river, near Cirencester, the path follows the Thames for around 184 miles through beautiful rolling countryside and historic towns and cities. The path ends on the far side of London at the Thames Barrier in Greenwich. 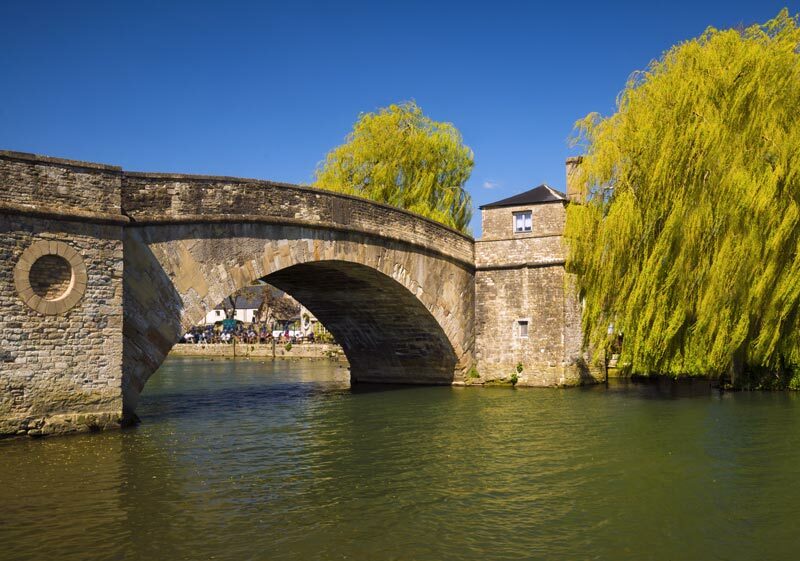 The name 'Lechlade' is derived from the River Leach which flows into the Thames here. Life has always revolved around the water in one way or another and Lechlade has flourished over the centuries. Goods from London could shipped be into the very heart of England while local produce flowed in the opposite direction. In the town's early years salt from Droitwich was loaded onto boats here and later Cotswold stone from the quarries in Taynton was transported on barges. Taynton stone was used in many iconic buildings such as Eton School, several University of Oxford colleges, Windsor Castle and Old St Paul's Cathedral. The 1789 construction of the Thames and Severn Canal brought further prosperity to Lechlade as it joined the Thames at Inglesham, a couple miles to the west of the town. With the advent of the railway the canal fell into disuse and neglect. However, over recent years projects to restore sections of the canal have been undertaken, including plans to rennovate the lock and waterway at Inglesham. The little church of Saint John the Baptist at Inglesham is well worth a visit. Dating back to Saxon times it oozes history. A Market Charter was granted to Lechlade in 1210 and this tradition was revived recently to celebrate the 800th anniversary. Today a monthly market selling local produce is held in the old market square in the centre of town. 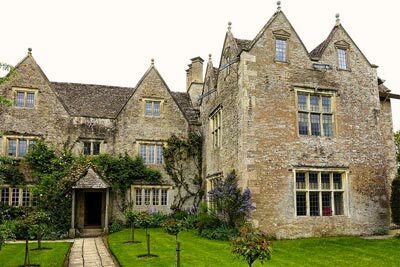 Not far from Lechlade is Kelmscott, a Tudor manor house which was the summer home of William Morris, the founder the Arts and Crafts Movement. The house and gardens are now open to the public and contain many of Morris's famous textile patterns as well as much of his furniture.